"You are offered a gamble on the toss of a [fair] coin. If the coin shows tails, you lose $100. If the coin shows heads, you win $110. Is this gamble attractive? Would you accept it?" Experiments show that most people would not accept this gamble, even though the expected gain is $5. This is the so-called "loss aversion" behavioral bias, and is considered irrational. Kahneman went on to write that "professional risk takers" (read "traders") are more willing to act rationally and accept this gamble. It turns out that the loss averse "layman" is the one acting rationally here. It is true that if we have infinite capital, and can play infinitely many rounds of this game simultaneously, we should expect $5 gain per round. But trading isn't like that. We are dealt one coin at a time, and if we suffer a string of losses, our capital will be depleted and we will be in debtor prison if we keep playing. The proper way to evaluate whether this game is attractive is to evaluate the expected compound rate of growth of our capital. Let's say we are starting with a capital of $1,000. The expected return of playing this game once is initially 0.005. The standard deviation of the return is 0.105. To simplify matters, let's say we are allowed to adjust the payoff of each round so we have the same expected return and standard deviation of return each round. For e.g. if at some point we earned so much that we doubled our capital to $2,000, we are allowed to win $220 or lose $200 per round. What is the expected growth rate of our capital? According to standard stochastic calculus, in the continuous approximation it is -0.0005125 per round - we are losing, not gaining! The layman is right to refuse this gamble. Loss aversion, in the context of a risky game played repeatedly, is rational, and not a behavioral bias. Our primitive, primate instinct grasped a truth that behavioral economists cannot. It only seems like a behavioral bias if we take an "ensemble view" (i.e. allowed infinite capital to play many rounds of this game simultaneously), instead of a "time series view" (i.e. allowed only finite capital to play many rounds of this game in sequence, provided we don't go broke at some point). The time series view is the one relevant to all traders. In other words, take time average, not ensemble average, when evaluating real-world risks. The important difference between ensemble average and time average has been raised in this paper by Ole Peters and Murray Gell-Mann (another Nobel laureate like Kahneman.) It deserves to be much more widely read in the behavioral economics community. But beyond academic interest, there is a practical importance in emphasizing that loss aversion is rational. As traders, we should not only focus on average returns: risks can depress compound returns severely. 1) Alpaca is a new an algo-trading API brokerage platform with zero commissions. 2) AlgoTrader started a new quant strategy development and implementation platform. I briefly discussed why AI/ML techniques are now part of the standard toolkit for quant traders here. This real-time online workshop will take you through many of the nuances of applying these techniques to trading. 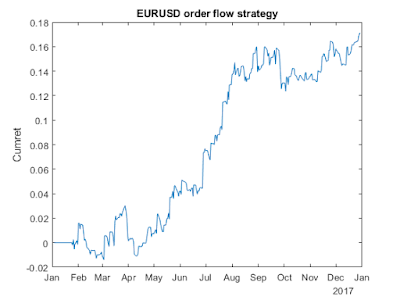 Order flow is signed trade size, and it has long been known to be predictive of future price changes. (See Lyons, 2001, or Chan, 2017.) The problem, however, is that it is often quite difficult or expensive to obtain such data, whether historical or live. This is especially true for foreign exchange transactions which occur over-the-counter. Recognizing the profit potential of such data, most FX market operators guard them as their crown jewels, never to be revealed to customers. But recently FXCM, a FX broker, has kindly provided me with their proprietary data, and I have made use of that to test a simple trading strategy using order flow on EURUSD. 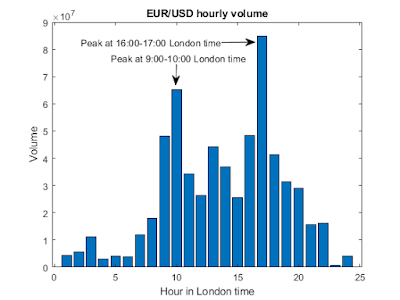 It is not surprising that the highest volume occurs between 16:00-17:00 London time, as 16:00 is when the benchmark rate (the "fix") is determined. The secondary peak at 9:00-10:00 is of course the start of the business day in London. We can see that the average next-day returns are almost monotonically increasing with the previous day's order flow. The spread between the top and bottom quintiles is about 12 bps, which annualizes to about 30%. 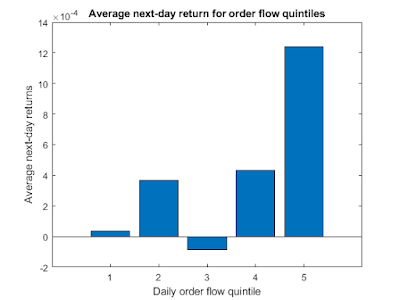 This doesn't mean we will generate 30% annualized returns, since we won't be able to arbitrage between today's return (if the order flow is in the top or bottom quintile) with some previous day's return when its order flow was in the opposite extreme. Nevertheless, it is encouraging. Also, this is an illustration that even though order flow must be computed on a tick-by-tick basis (I am not a fan of the bulk volume classification technique), it can be used in low-frequency trading strategies. 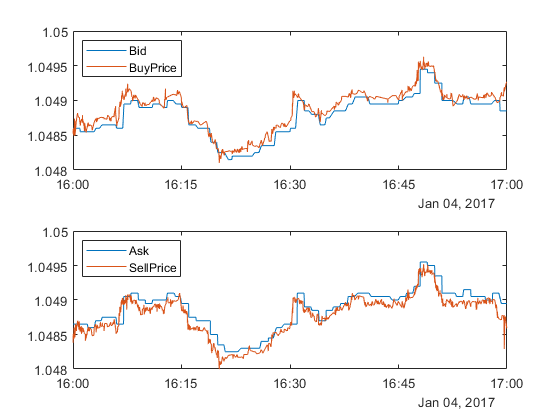 We can see that by and large, the relationship between trade and quote prices is satisfied. We can't really expect that this relationship holds 100%, due to rare occasions that the quote has moved in the sub-millisecond after the trade occurred and the change is reported as synchronous with the trade, or when there is a delay in the reporting of either a trade or a quote change. The CAGR is 13.7%, with a Sharpe ratio of 1.6. Not bad for a single factor model! Acknowledgement: I thank Zachary David for his review and comments on an earlier draft of this post, and of course FXCM for providing their data for this research. 1) Qcaid is a cloud-based platform that provides traders with backtesting, execution, and simulation facilities. They also provide servers and data feed. 2) How Cadre Uses Machine Learning to Target Real Estate Markets. 3) Check out Quantopian's new tutorial on getting started in quantitative finance. 4) A new Matlab-based backtest and live trading platform for download here. 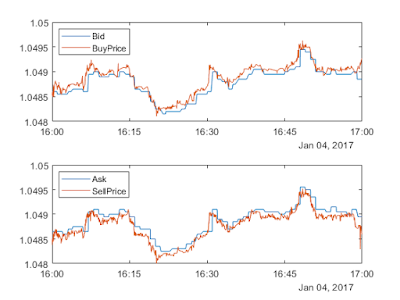 5) A nice resource page for open source algorithmic trading tools at QuantNews. As traders, we of course need money to make money, but not everyone has 10-50k of capital lying around to start one's trading journey. Perhaps the starting capital is only 1k or less. This article describes how one can take a small amount of capital and multiply it as much as 10 fold in one year by taking advantage of large market inefficiencies (leading to arbitrage opportunities) in the sports asset class. However, impressive returns such as this are difficult to achieve with significantly larger seed capital, as discussed later. Arbitrage is the perfect trade if you can get your hands on one, but clearly this is exceptionally difficult in the financial markets. In contrast, the sports markets are very inefficient due to the general lack of trading APIs and patchy liquidity etc. Arbitrages can persist for minutes (or even hours at a time). Consider a very simple example of sports arbitrage; Team A vs Team B and three bookmakers quoting the odds shown in the table below. When the odds are expressed in decimal form we can calculate the implied probability of the event e occurring as quoted by bookmaker i as P(i,e) = 1/Odds(i,e) (shown in brackets in the table). The above example is a 'simple' arbitrage. However, the majority of football arbitrage opportunities are 'complex' arbitrages. Complex in the sense that the bet legs are not mutually exclusive and more than one leg can pay out over some overlapping subset of possible outcomes. The calculation then becomes more complex. We can construct a payoff matrix to more easily visualise the outcome dependent payoffs of the 3 bet legs. The structure of the Payoff Matrix reveals a 'potential' arbitrage because there exists no column (event outcome) that contains only negative cash flows. It is a potential 'complex arbitrage' because in the event of a draw or home team win, there exists two bet legs that can give rise to a positive cash flow for the same outcome (remember, -0.5 means half of the stake is returned so is still positive). However, whether or not the arbitrage can be 'realised' depends on whether or not we can find a solution for the stake percentages for each leg that gives a positive net profit for every outcome. So how do we do this ? We can see that the arbitrage does indeed have a solution with the stake percentages (60.2%, 34.1%, 5.7%) giving an arbitrage of 1.7% for every possible outcome. There are many thousands of these arbitrage opportunities appearing each day in the sports markets ranging in size from 0.1% - 7%+. What returns are possible? Consider, starting with a seed capital of £1k and a trading frequency of 3 times per week with an average arbitrage size of 1.6%. Initially we compound our winnings but there are limits to how much you can stake with a given bookmaker. Assume that we cannot increase our notional beyond £5000 across any multi-leg arbitrage trade. In that case, the initial £1k can grow to approximately £9,500 in one year. Not bad for a few minutes of effort per trade. There are really only two pitfalls. 1) Scaling: You cannot easily compound your returns as with the financial markets. 2) Limit Risk: Bookmakers don't want you to win and can be inclined to significantly reduce your allowed stake notional if you win too much. Avoiding this requires careful management. Although sports arbitrage does not easily scale, it is a great way of boosting trading capital by a few thousand pounds per year with very small time effort; capital which could be put to use in the financial or crypto markets. About the author: Stephen Hope is Co-Founder of Machina Trading, a proprietary crypto & sports trading firm that provides an arbitrage tool called rational bet. He is former Head of Quantitative Trading Strategies at BNP Paribas and received his PhD in Physics from the University of Cambridge. These intense 8-16 hours workshops cover Algorithmic Options Strategies, Quantitative Momentum Strategies, and Intraday Trading and Market Microstructure. Typical class size is under 10. They may qualify for CFA Institute continuing education credits.